Will Republicans make a comeback? Truth:“Until women achieve equal representation at every level of government, until we have a seat at every table and our voices are part of every conversation, until we’ve broken every barrier and shattered every glass ceiling, we must keep running for office and never give up.”-Senator Kirsten Gillibrand This is a photo taken at the Amherst Democratic Committee Headquarters with my friend Joanne McCartin. Elections Are Over - What's Next? More good stuff...I met a corn farmer at a farmer’s market in Rochester. Duncan and I chatted a bit. 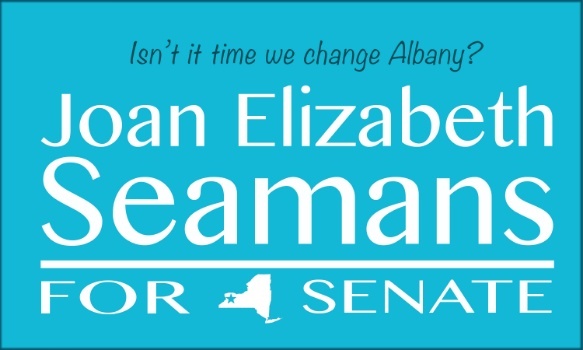 He is a Republican who is very disillusioned with corruption in government and mentioned Chris Collins.At the end of our conversation, he gave me his vote, three ears of corn and an ok to put up a sign.#PeopleOverPoliticsJoan Elizabeth Seamans for NYS Senate.